This apartment is located in a beautiful park, right beside wonderful Lake Idro. The complex consists of 22 comfortable and modern apartments, surrounded by a park. Guests have access to a beautiful (heated) pool with Jacuzzi and separate children's area. Garden furniture is also available. Facilities include two grills for common use, a playground for children, a laundry and a wellness center equipped with a sauna, Turkish bath and gym. The complex also has a bar, a large community room and a reception area where you can get information regarding the most beautiful sights and attractions in the region. There is a parking lot as well. The Residence is part of the program Destination Charging the Tesla and will provide its guests in 2017 a pioneering service: charging station for electric cars (two wall TESLA connectors of 11 kW each, customer service). 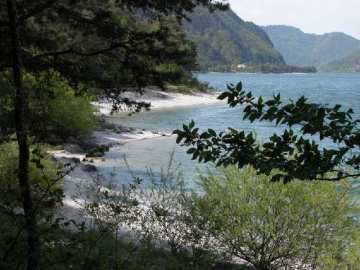 This holiday complex is situated directly on the beach of Lake Idro. From the complex you can enjoy a view of the lake and its surrounding mountains (Dolomites, Valvestino and the Alps). There are many sports opportunities in the area, such as windsurfing, sailing, kite surfing, mountain biking and trekking. On a sightseeing flight you can enjoy the territory from the air. Explore the natural parks of Adamello, Alto Garda and Giudicarie by bicycle (bicycles can be rented 300m away). There are plenty of opportunities for hiking in this beautiful, mountainous area. Of course you can also go on excursions to such places as Brescia, Verona, Mantua, Venice and Milan. For advice and booking of tourist programs please contact the reception desk of the complex. This large flat is suitable for six to eight persons and has two floors. This apartment has an area of about 90 m² and consists of 2 apartments which have an interior staircase and are connected by a door. On the ground floor you will find both living rooms furnished with two 2-person sleeping sofas. The two fully-equipped kitchens, bordering the living room, are equipped with a 2-burner electric oven, coffeemakers, microwaves, kettles and two refrigerators with freezer compartments. On the ground floor there is also a bedroom with a 2-person sofa bed and a bathroom with a shower, toilet, bidet and hairdryer. On the 1st floor there is a second bedroom furnished with a double bed and a second bathroom equipped with a shower, toilet, bidet and hairdryer. All apartments are comfortable and have modern furnishings, central heating, a storage locker and a television with satellite connection. From the covered terrace, complete with a table and chairs, you have a wonderful view of the mountains and lake. There is a second terrace located at the rear of the apartment, well-equipped with garden furniture. The price includes: use of the fitness center; use of the swimming pool (27 april 2018 - 28 Sept. 2019), playground for children; use of the barbecue; WiFi Internet (at the reception area). The residence bar (only for its customers) is opened from late May to early September. The pool is heated only with solar panels so the water temperature depends on the weather. Gas / water / electricity, 17 euro per person per week. Baby kit: highchair and crib 40 euro per week. Arrival time is between 15:00 and 20:00. Departure time: between 8:00 and 10:00.